What can I tell you about Mozart's The Magic Flute that you don't already know? That the Queen of the Night represented Austria's Maria Theresa and Tamino Joseph II? That it refers to no particular place or time, despite its Egyptian motives? How about this: While composing The Magic Flute, Mozart recycled the incidental music for Gebler's Thamos, King of Egypt. 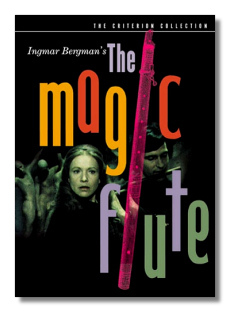 The best Magic Flute available on DVD is in Swedish! Bergman's acclaimed 1975 version has survived the transfer to DVD quite admirably. Irma Urrila, who bears an uncanny resemblance to Liv ullmann, plays a callow and idealistic Pamina. Her voice is sweet although a bit underutilized and restrained. Perhaps she could have made her anguish at Tamino's rejection more palpable. In the last act, her rapturous duet with Tamino ("Tamino mein! O welch' ein Gluck") is almost as poignantly as Papageno's "Pa Pa Pa" duet with his new love Papagena. As Tamino, Josef Kostlinger sings pleasantly and projects some impetuousness in his scene with the Speaker. He lacks not passion, but that vital dollop of insecurity, the sense that his fate's outcome is not so sure. Ragnar Ulfung's voice exude menace in his role as Monostatos, but he fails to play up the character's ludicrous side. Perhaps he should have cut loose more when Papageno makes him dance to the bells. Speaking of "Pa Pa Pa," Bergman ingeniously used stage snow to punctuate the actions the lovers, as they partially disrobe, oblivious to the flakes falling around them. Kudos to Bergman for subtly blending film devices with stage effects that could have been used in the 1791 debut, like the chattering skulls poking out of the darkness and the translucent, leaf-painted curtains that descend to signify spring's coming. Sometimes he displays a 20th Century irony, like when he places the singers in front of plackards as they sing these proverbial lines: "Two hearts that love have conjugated/And should not by man be separated." However, he did abridge the crone sequence between Papageno and Papagena so that it doesn't make a whole lot of sense when she appears toothless. But Håkan Hagegård, who later went on to a stellar solo career, is a nearly perfect Papageno. He is silly without being hammy and eminently believable as someone who just wants to coast through a crisis and, incidentally, land a wife. While not the best sung Magic Flute – I still prefer Klemperer's version from the mid-sixties, the one with Lucia Popp as a riveting Queen of the Night – it is superbly filmed and acted. Even the intermission is humorous, with a bewildered dragon wandering backstage in the wings and Pamina and Tamino playing chess!